B-Naturals.Com Newsletter » Blog Archive » If it Sounds Too Good to be True, It Probably is! Raw and Natural Nutrition for Dogs, Revised: The Definitive Guide to Homemade Meals! Lew Olson's newly revised edition is filled with an abundance of new topics and information. 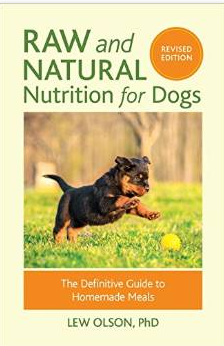 Whether you are new to home feeding or a seasoned raw feeder, have a senior dog or a new puppy, a pregnant mom or a toy breed, this book presents all the information you need to make the best nutritional decisions for your dog. The title of this newsletter has become a common statement of mine over the past several years. Part of having a Facebook Page with over 13,000 members (K9Nutrition), means hearing about many of the new Internet dog food claims, supplement claims, feeding claims and even ‘cures’ for everything and anything, all rolled up into one supplement, one diet, or one magic potion. Willard Water. Water from South Dakota that claims to cure ‘everything’. Just drink it or apply it to the affected area. Even though this product was debunked by ‘60 MINUTES’ and was forced to shut down by the FDA, it continues to sell today. Black Salve. This was sold as a ‘cancer cure’. What was discovered, however, is that it is simply a caustic acid, and ‘burns’ off skin tumors which is surely risky without a Medical Doctor or Veterinarian monitoring such a thing. As time went on, other fads occurred such as bovine colostrum, which does not do much for dogs and is truly only of value to baby calves during the first 48 hours after birth. It may very well carry hormones that are great for calves, but it could be dangerous for humans. Apple Cider Vinegar. This contains potassium and is not acidic. It actually turns alkaline in the body. It has no miracle cures and if given to dogs daily, it can erode their tooth enamel. Before the ‘age of the Internet’, only a few products that had no scientific studies run or background to support claims, sold so well or so fast. ‘Home remedies’ have been around for a long time and many of them can be valuable, but when you see claims that a ‘single remedy’ will cure cancer, asthma, HIV, eliminate pain, cure shingles and arthritis, you are looking at ‘snake oil’. It is simply impossible for any single product to cure all these ailments and illnesses. When someone has a sick dog, they become desperate. They tend to believe the wording and claims of the advertisements and buy anything they can in their desperation if they think it will help their dog. That is how marketers reel you in. Sadly, they take your money to make their money with no concern for the consequences or health of your dog. They may put exciting, compelling claims in their ads, such as it ‘Cures everything! Nothing else is needed! Guaranteed results! Absolute health!’ They may use testimonials and show you ‘before’ and ‘after’ pictures of dogs, but how do you know these are real? They may use short videos with exciting language and colors to compel you to buy expensive video sets, books, or supplements and to subscribe to their magazine or blog. They may convince you they have designed a ‘fool proof’ diet plan or premade food that contains the perfect balance. Be cautious, as these gimmicks abound for these tactics! Just check out any human health or nutrition site, particularly body-building sites or human supplement sites. Some will even get you to join Facebook pages or download free ‘pamphlets’ or ‘books’ and then use guilt and shame tactics to get you to buy their remedies or feeding techniques, or to pay to subscribe to their page, blog, or magazine. What you generally won’t find with these marketing tactics are valid resources, citations, or other real data that supports the claims of the products, diets or remedies as being effective. I have seen some large companies show research data, but when I looked carefully at the research, I found the company paid for the research. Therefore, they got the conclusions they wanted and needed to market the product, rather than providing the full and real facts! If it sounds too good to be true, it is indeed too good to be true! When you find a product that sounds interesting, do your research! Do a google search on the product, the ingredients or the recipe. Don’t rely on ‘opinion’ sites or blogs. Look for research articles. Well researched articles will contain citations to back up what they have found and they will describe their research techniques. Citations are generally found at the end of the article or paper. These citations are not written by the company who is selling the product or the writer who may work for, and receive money from, the company trying to sell the products. I also suggest going to the listed citations in the article, and reading them, to gather further information! Fads, myths and old wives tales will come and go, but please don’t be fooled. There is good information that can be found on the internet, as well as information with false claims, gimmicks and sales techniques. You can check on many of these claims on my Facebook Page, K9Nutrition. We go over these all the time to find valid citations on various remedies, ingredients and foods. We post real data so you can make an educated decision! Please, NEVER rush off to buy something without doing your research first! Your dog deserves the best care possible and in today’s world, you also need to be smart with your money! Always research carefully what you put into your dog’s mouth and onto their skin and bedding carefully – just as you would (or SHOULD) do for those things you choose to use for yourself. ALWAYS check side effects of prescription medications as well. Education is the best tool to understand the reality and effectiveness of the claims and safety of what you choose to buy for the health of your dog. Don’t second guess or hope for the best! Do your homework!